Did you all get a chance to check out my new "Party Ideas" tab at the top of the page? If not, check it out! It's still a work-in-progress as we've only documented a few of our shindigs so far, but I figured it would be an easy way to find all of our past party themes, tips and ideas all in one spot! Today, we're going to talk about beverages! One of my biggest pet peeves when going to a party is not knowing where to find the drinks. Has that ever happened to you? There's a huge buffet of food set out, but the beverages are nowhere to be found! This has happened to me a few times! 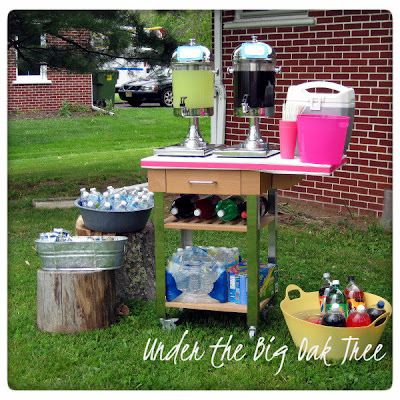 When Joe and I started hosting parties at our home, whether it's indoors or out, I've always set up a beverage station. By setting out a variety of drinks, ice, cups, straws, cocktail napkins, etc. I make it easy for my guests to just grab what they want! In the photo above, I set up 2 drink dispensers that I borrowed from a family member. This is a great way to serve lemonade or punch or even some mixed cocktails for the adults! Some vintage buckets, enamel tins and even a colorful party bucket filled with ice and sodas, waters and juice boxes make it easy for guests to see what they'd like without having to dig through a bunch of ice chests! I also like to keep extra beverages handy, that way if one of the buckets starts to run low, anyone there can just refill it without having to search for me (or Joe) to find out if we have more water or juice boxes! Another thing, I like to do, but is not shown in the above photo, is to keep a large cooler full of ice behind the drink station. Keeping extra ice near by makes it easy to add more ice to the bucket as it melts. Obviously, a station like this one is for a larger party. When having friends over for dinner, I like to do something similar. I usually reserve a spot at the end of our kitchen counter to put some cups, ice and drinks. Again, making my guests feel more welcome to just help themselves to a cold drink!